A cyclo-cross bicycle is a bicycle specifically designed for the rigors of a cyclo-cross race. Cyclo-cross bicycles roughly resemble the racing bicycles used in road racing. The major differences between the two are the geometry and the wider clearances that cyclo-cross bikes have for their larger tires and mud and other debris that is picked up by them. Cyclo-cross is a discipline run on 2.5 to 3.5 circuits, including clearings, roads, country lanes and paths through forests. The riders have to do several laps of the circuit over a period of no more than an hour. 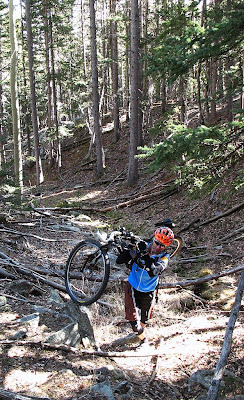 To make their way along steep paths, muddy tracks and artificial obstacles, sometimes the riders even have to carry their bikes. The following are rules that have been put in place by the UCI that are either specific to or have particular effect on cyclo-cross bicycles. Bear in mind that these rules are not exhaustive, are only for UCI sanctioned events and may not be enforced at all cyclo-cross events. Handlebars must not measure more than 50 cm (19.5 inches) in width. Tire width may not exceed 35 mm and tires may not feature any kind of studs or spikes. The bicycle must not weigh less that 6.8 kg (15 lb). In recent years, some cyclo-cross bicycles available in the consumer market are supplied with disc brakes, which violate UCI regulations, as a stock item. In general these bicycles have braze-ons to enable the use of cantilever style brakes instead. In the United States, disc brakes are now allowed for non-UCI events. In some countries (including the United States, so long as it is not a UCI event) riders are also permitted to race in cyclo-cross events using mountain bikes (generally without bar ends), at least in low-level competition, but this is not currently allowed in events on the international calendar. It has been known for local races to be won on mountain bikes, particularly if the course is technical with little road or fast sections. However, for a traditional cyclo-cross course a cyclo-cross bicycle is the most suitable tool for the job. According to the owner, the original intent of the build was to race cross but as a SS, then he altered then plan and added gears to make it a training bike. However, this fall he plans on altering his Qball to be a SS CX bike and race at a few CX events along the Front Range (Colorado). The current build with gears is around 26 lbs – a bit more effort needed to shoulder this beast as opposed to a CX bike. As far as what it's like to ride, check out Calvin's ride report. Nice utility bike! Very Willits-esque. Yeah, that willits fork is awesome. I would like one for my 69er to get a little more A-C height so I can run a larger tire. Right now, the Surly 1x1 only allows a 29x2.1. I figure when it's time to replace the fixation, I will go all steel and try to get a Willits. I see an Evil Sovereign in my future with that fork!